It’s easy to throw on a pair of athletic shorts to go for a jog or play some basketball, but sadly these shorts will let you down on a hike, don’t you think? They’re simply not made to take on a mountain or a trail. You know you need shorts that are made exactly for those purposes—namely the best men’s hiking shorts. Hiking shorts aren’t your average summer wear but they are an absolutely necessary gear for the outdoor enthusiast within you. Investing in high-quality hiking shorts is worth it because of the comfort, fit, and durability that they offer. Nothing is worse than uncomfortable shorts that ride up, get caught on things, and begin to chafe after a mile or two. On top of all that, the feeling of reaching into your pocket only to discover a hole where your things used to be will kill your whole hike. If you manage to purchase the best hiking shorts, you can be sure that your pants will not bother you for the entirety of the hike. Instead, they will support you and make the hike easier for you. In this article, we will help you get the best men’s hiking shorts to make your hike go smoothly. First, we will list the factors that you should take into consideration when purchasing your next or first hiking shorts. Then we will move on to reviewing the top 6 products currently available on the market so you won’t have to sift through the massive array of options available out there on your own. You should consider the comfort level of your shorts. Spend some time shopping around and think about an adjustable waistband and maybe a little flexibility. Since hiking shorts are typically very durable, they will last for a very long time. Not many people can stay the same size over a long period, so an adjustable waistband would definitely help in keeping you comfortable while wearing these shorts. A couple extra pockets couldn’t hurt either since you’ll typically need to carry quite a lot of small supplies with you while en route and these pockets are the perfect place to store them in. Hiking shorts can come in a variety of materials. Some feature thin Nylons and others are a heavier cotton. Make sure to consider your climate to determine whether you’re willing to give up some breathability for added durability. The nylon shorts are often cooler and thinner than their cotton counterparts. Many of these shorts are shorter and resemble running shorts so make sure you’re buying the right pair for you. The nylon won’t ride up and it’s sure to keep from binding and chafing as you conquer the trail ahead. Nylon is also great for wet situations as they will keep the water off of you and dry out quickly if you take a break to cool off in a body of water. The nylon is undoubtedly more athletic, but keep in mind, these shorts will end up restricted to the trail, unlike their counterparts that are acceptable to wear out to a casual dinner. Cotton shorts will be a little bit thicker and stiffer. These shorts are generally khakis and will look at home at a casual cookout or just relaxing with friends. They often feature significantly more pockets and longer inseams than their nylon competitors. These are definitely for more casual hikers who like to stop by for a happy hour after they get off the trail. These shorts are good for almost any occasion. The durability of your hiking shorts should be unmatched by the other shorts in your closet. Look for strong materials and reinforced areas. Very few things are as inconvenient as having a tear in your pocket or in the crotch of your shorts. Potentially loosing important gear or showing off a little more skin than you originally planned on can put a damper on your hike. Look for quality stitching. Often times reinforced double stitching will drive a higher price, but in most cases, the extra money is worth it. Make sure the stitching is consistent and there are no looks threads or stitching that could get caught on the brush. If you can’t inspect the shorts in person take some time to read reviews from others who have purchased them. Also, check the design of your shorts to make sure the belt loops and pockets don’t stick out to a point where they could snag on things and rip. This will also save you a hassle on the trail or on the mountain. Look for a thin profile that still leaves ample room for your legs. Having shorts that fit you properly is the most important factor when it comes to picking the best hiking shorts for your next time on the trail. Take the time to try on a handful of different shorts by different brands. Every brand will have a different cut and some will fit your body better than others. Try on different sizes just to see if going a size up or down might be what you need. Put your ego aside and try on those XL’s just to be sure. Having shorts that fit properly will keep them from riding up, binding, and chafing. You should also consider the length of the inseam. A shorter inseam is usually found on nylon shorts that resemble running short more than a traditional pair of hiking shorts. Having shorter shorts will provide a little extra airflow where it counts. The drawback is that if your thighs aren’t used to seeing the sun, they’ll burn quickly. You don’t want to end up waddling around for the next few days. It’s also worth noting that shorts are slowly becoming shorter and a 7-inch inseam is very popular as opposed to the 9 inch inseam that has been popular in the past. Longer shorts do have their positives though. Many people feel more comfortable covering themselves a little bit more. There’s nothing wrong with that. If you know you’ll feel weird showing more thigh than usual, just skip it and stay in your comfort zone. Longer shorts also offer more sun protection and more real estate for additional cargo pockets if you need them. There are a few different styles of hiking shorts. 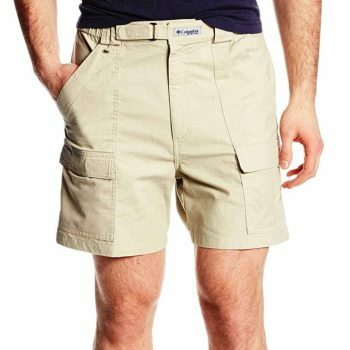 You have your standard cargo shorts with a couple extra pockets down your thighs, standard flat front shorts with just two side pockets, and shorter shorts that often have no pockets. Each has their pros and cons so it’s important for you to determine which will provide the best hiking experience for you. Cargo shorts have the most storage out of any style. They’re generally longer shorts and are undoubtedly the heaviest and most uncomfortable option. 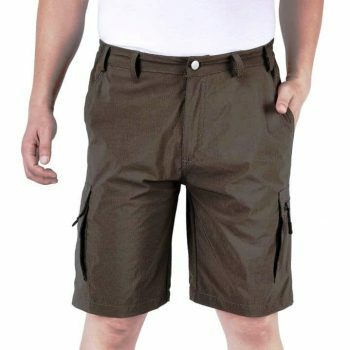 Cargo shorts also have the widest profile and are prone to get caught on brush. Many people are willing to overlook those drawbacks for the benefit of a few more large side pockets. Depending on how much you plan to carry and whether or not you’re bringing a backpack you might not even need the extra space. Flat front shorts are the most stylish option. In many cases, these look like your standard khaki shorts. They’re perfect if you plan on wearing them even when you aren’t on the trail. The lack of cargo pockets gives them a narrower and sleeker profile which will look better on you and keep them from getting caught on anything. These shorts can vary in length from a 9 inch to 4-inch inseam. They’re also not restricted to any specific materials or styles. The shorts without pockets may sound inconvenient and I won’t deny that pockets are on almost every pair of shorts we buy for good reason. Before you count these out I urge you to try them on. They are very light and give more room for your thighs. They’ll also have a nice slim profile that won’t catch any brush during your hike. If you plan on carrying a backpack these shorts can make your hike a much better experience. 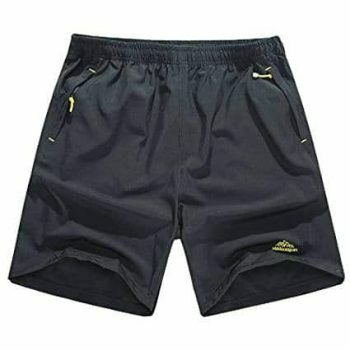 Most of the shorts with no pockets are shorter nylon shorts and can often end up looking very similar to running shorts. It’s hard to add too much to a pair of shorts, but be on the lookout for washing instructions and added features like mesh linings. A decent number of the shorter nylon shorts also feature a reversible design that will allow you to get a couple wears out of your shorts without anyone noticing. An elastic waistband can also be found on most shorts. They’ll stay snug, but provide just enough wiggle room to keep you comfortable. Keep a lookout for the aforementioned features and determine whether or not they add value to you and make your hiking experience any better. Now we will show you our favorite products on the market and why are they so good. The Columbia Half Moon II Shorts are a perfect combination of lightweight and durable. They come in a variety of colors and sizes ranging from small to XXL. These shorts have a 6-inch inseam, but they’re truly a little bit shorter than that. If you’re shy about showing your thighs, you should perhaps look elsewhere. These shorts also have an elastic waistband and belt loops to make sure the shorts fit exactly as you want them too. The only surprise may be the bagginess through the legs. They flare out a little bit after the waistband. If you’re looking for a slim profile, these aren’t for you. While these shorts feature a few extra pockets, they aren’t very large and truly don’t add much functionality. Trying to load the small pockets up will cause your shorts to ride up and create chafing on your inner thighs. The hip pockets are a different story though. They are very deep and feature a slash design that makes them easy to reach into, but the depth of the pockets means your items are never in danger of falling out. Overall, these shorts will do well on the trail but are truly made for being around the water. They will dry out quickly and provide protection from the sun. These are good for the hike there and once you’re on the water. Related: Since these shorts are geared towards people headed for a water adventure, those who need these shorts may also benefit from having this Super-Brella Portable Weather Shelter in their backpack. The riverside or the lakeside are known for experiencing an excessive amount of rain. When it gets wetter than even these water-resistant shorts can handle, simply pop up this handy portable shelter. The Singbring Quick Dry Shorts are a great addition to this list. They are very athletic and are great for everything from biking to running to mountaineering. You can expect these short to keep you cool and dry. They generally run a little bit large and feature a 7 inch inseam that is a little bit on the shorter side of that length. They are also baggy through the legs despite them appearing fairly tight in the product pictures. These shorts will be comfortable even in the most athletic situations. Don’t expect to wear them to dinner though. These shorts feature pockets on the hips and the backside of the shorts. All of the pockets feature reinforced stitching and close with zippers to make sure your things stay put. This will be especially helpful if you plan on doing any climbing, biking, or running with them. The pockets are a decent size and have a smooth liner. It will keep them from catching on your legs and creating any chaffing. These shorts are great for the most athletic hikers, but for casual hikers, they might offer more than you need and draw back from the flexibility of being able to wear them in other situations as well. These are a safe pick if you need something comfortable and ready to take on anything you can throw at them. Related: These shorts are perfect for those who care more about durability and flexibility than appearances. They are not much to look at and you might feel a bit embarrassed about strutting around in them after you’re done with your exercise, but if it’s the beach, you’ll fit in perfectly with these shorts. If you’re hitting the beach with these shorts, don’t forget to bring this Blue Sky MALIBU Beach Bag with you. The Nonwe Cargo Shorts are a safe bet for the casual hiker. They’ll do well on the trail, but aren’t out of place when grilling out or going to a casual dinner. These shorts can be worn all day long without anyone batting an eye. They come in three colors. The green color option is more of a brown than green. Keep that in mind while ordering. These shorts can accommodate waist sizes anywhere between 32 and 40 inches without any issues. They also feature a longer 9-inch inseam for anyone who isn’t comfortable showing too much thigh. These shorts are a little bit heavier than the others on the list and that can be attributed to the longer inseam and the cargo pockets. The material is also slightly thicker. They’re more comfortable than your standard cargo shorts though. The shorts have pockets on the hips, backside, and cargo pockets. The cargo pockets can be closed with a zipper and stay fairly tight to the leg of the shorts to keep from getting caught on things. The other pockets are nothing special. They’re deep enough to keep things from falling out and are also easy to get into if you order the right size. You can expect these shorts to transition well from a hike to happy hour. The average hiker will stay comfortable in them without committing to an athletic style. Related: As these shorts have quite the lengthy inseam, they are perfect for tall people. 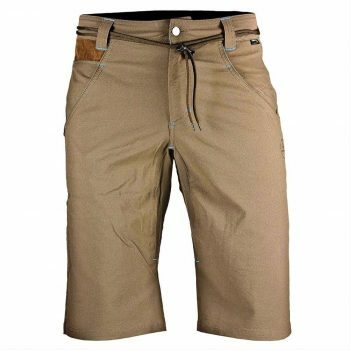 They are also a great choice for those who need shorts with a larger waistline. If you are plus-sized, you’ll need camping or hiking gears designed with you in mind, such as this The Friendly Swede Sleeping Bag Liner. It’s designed to be compatible with larger sleeping bags. The Royal Robbins Backcountry Shorts are everything you could want from some serious hiking shorts. They’re durable, quick dry, lightweight, comfortable, and come in at a great value. You can expect these shorts to stay comfortable and hold up to anything you throw at them. They will never snag and very rarely tear thanks to the 100% Supplex nylon material. The imported shorts also feature reinforced stitching and a second layer in the back to make them extremely durable. These shorts also feature a gusseted crotch to release stress from the stitching in the area. They’re sure to be durable enough for anything you throw at them. They will accommodate anyone from a small to XXL and have a 6-inch inseam. Like many of the other shorts on the list, the inseam is on the shorter side of their advertised measurement. These shorts also sit fairly high up on your waist. They feature a fully elastic waistband and come with a quick release web belt. The pockets are located on both hips, backside, and cargos. The cargo pockets sit more on the front of the thigh than many other shorts, but this helps to keep the profile narrow and to prevent snagging. They should have plenty of space for all of your things. Overall, these shorts are great for the avid hiker. They’ll stand up to anything and you’ll be comfortable in them all day. Related: These shorts are perfect for long-distance hikes because of their astounding durability. During such long hikes, you’ll definitely need a burner such as this MSR PocketRocket 2 Stove. Even though you’re outdoors, it doesn’t mean that you’ll have to give up on cooking and eating delicious foods. 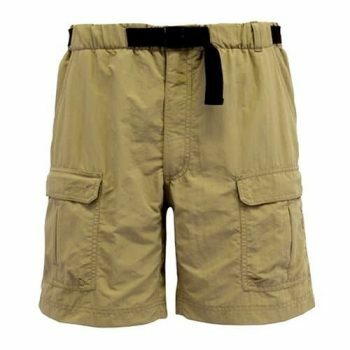 The Falcon Bay Big and Tall Cargo Shorts are sure to satisfy the needs of anyone shopping for some larger shorts. They’re lightweight and durable. The elastic waistband will make them extra comfortable. They can accommodate anyone from a 4x to 8x and feature a 9 inch inseam that is a little bit on the longer side. They fit comfortably as a lower cut. They’re 100% cotton and much more casual than other shorts on the list. They’ll look great in their element on the trail or while you’re hanging out with friends. The color options are sure to satisfy even the pickiest customers. You can comfortably wear these all day without looking out of place. They feature pockets on both hips, backside, and two cargo pockets. The pockets on the back and cargo pockets are both Velcro. Some people may see whit as a positive, some as a negative, but that is strictly personal preference. The pockets are a good side, but the hip and back pockets will rub against your legs inside the shorts. These shorts are comfortable, stylish, and come in large sizes. They could be exactly what you’re looking for to stay comfortable in the heat. Related: These shorts are really stylish, so you should wear a stylish top to go with it too. This Southern Marsh Collection Tee would make a great addition to your hiking wardrobe since it’s both tough and comfortable. The La Sportiva Chironico Shorts are the most expensive on our list, but for good reason. These shorts are as well made as they come. They will withstand anything you can throw at them. They’re longer than the rest of the shorts with a 13-inch inseam. The inseam isn’t quite as long as they’re listed, but they will still come to the bottom of your knee and potentially further. The shorts will accommodate anyone from an XS to XL. They come in khaki and gray, but the gray color is more of a gray-blue. The shorts also have leather inserts on the right front panel above the pocket opening. On top of that, they also have reinforced stitching throughout. The reinforcement is stitched in a different color and gives the shorts a unique style. They have pockets on both hip and the back. They also have two special pockets that aren’t featured on any other shorts in this list. The first is the change pocket integrated into the right hip pocket. It’s the same small pocket you find on your average jeans. It may not be particularly helpful on the trail, but it is an added bit of functionality. The second extra pocket is a “toothbrush” pocket on the right leg. The pocket would be perfect for holding a pocketknife on the trail. Overall, these shorts are good for most scenarios, but their unique styling may sway some. Related: High-quality shorts should be matched up with high-quality boxers. These David Archy Performance Boxer Briefs would fill in that role for you perfectly. Made from polyamide and spandex, these boxers are as comfortable as they come. This list of hiking shorts should be all you need to pick the right pair for your next time on the trail. The variety of shorts can be daunting to sort through, but once you know what you’re looking for, the catalogs are much easier to navigate. With summer just around the corner, do you have any hiking shorts you would recommend? Do you own any of the shorts on the list or do you intend to go purchase one of them immediately after this? What made you choose that particular pair of shorts? Let us know in the comments!